New version of the Wemo app taps the Nest Home/Away Assist feature. 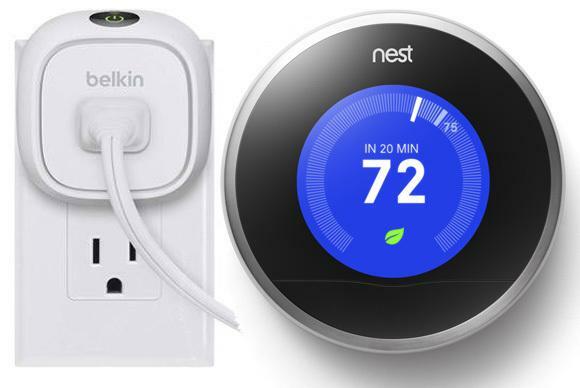 Belkin’s Wemo line of smart-home products will become the latest devices to participate in the Works with Nest program when Belkin releases its Wemo app version 1.15 for Android and iOS devices later this morning. If you own both a Wemo and a Nest Learning Thermostat, you’ll be able to configure your Wemo Switch, Wemo Insight Switch, Wemo Light Switch, and Wemo Maker to control lights and appliances in your home using the Nest’s Home/Away Assist feature. The Nest’s Home/Away Assist feature uses activity sensors in the thermostat plus the location of your smartphone to determine when your home is occupied or empty. The benefit of using both inputs is that the thermostat can still make that determination if you forget to take your phone with you or if its battery dies. Wemo users will now be able to program a Wemo switch so that it turns lights off when the Nest thermostat goes into Away mode, and back on again when it switches to Home mode. Belkin suggested other examples, too: A fan could turn on while the thermostat is in Away mode to circulate air while the home is empty, reducing the load on the air conditioner when you come home again. Owners of the hobbyist-oriented Wemo Maker, which lets you control a variety of low-voltage devices (motorized blinds, small motors, and irrigation system, for instance) with your smartphone, can do even more. Why this matters: The only thing that’s surprising about this announcement is that it didn’t happen sooner. The Works with Nest program launched nearly two years ago. Nonetheless, having leading players in the smart-home market announcing new integrations is always a good thing.